The Algarve, for me, is always a day of vacations (...) The land does not harass the feet, the sea does not tire the ears, the cold does not numb the limbs, and the fruits are sweet and always at the height of the hand. (...) The idea that I have of an earthly paradise, where man can live happily to the natural, comes to me from there. Houses whose roofs, neither of stalk nor of slate, are rooftops of harem for a free and spontaneous love in the moonlight; people who do not cover themselves with crocs or pelts, but put the lazy shadow of an umbrella over the warmth of the body; and tiny fig trees, midgets (...) A paradise in which Christian maceration does not enter at all. This is the most exclusive Vila Monte Farm House. Where the rooms gave place to a collection of original suites, with their own personality. 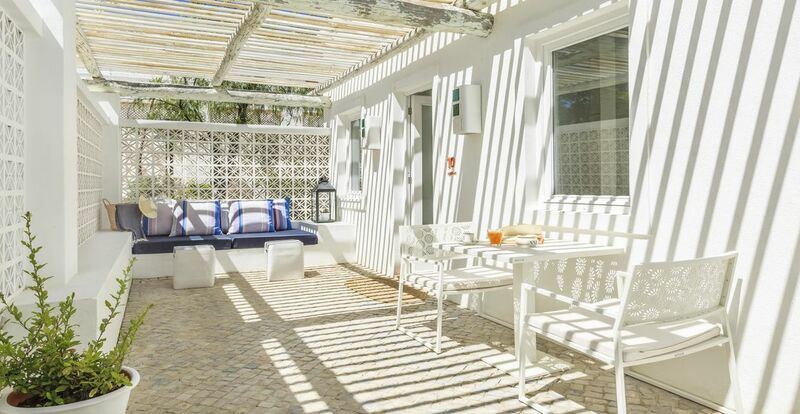 What assemble all these spaces is the authenticity, the simplicity of the Algarve architecture with its strong Arabic inspiration, the local crafts and the facilities and standards available in all these suites. In addition, this collection offers a personalized service by a dedicated team, premium amenities and unique features that guarantee high standards of comfort in the Suite Collection for the best of Vila Monte experiences. Then, in each of these spaces, you will find places of immersion - each with its own characteristics - with independent configurations and additional exterior areas - for unique and contrasting experiences. Because that is what Vila Monte is made of: unique moments and generous memories. The two buildings of Casa de Cima are the oldest buildings of Vila Monte Farm House. They had been, for some time, a house of habitation, erected in the typical architecture of the Algarve that, meanwhile, underwent several extensions. Currently it is the Vila Monte area reserved for adults and where you will find a swimming pool with limited access to the new ones. It is also the building where most of the accommodations that integrate the Suite Collection are located. The right choice for those who want to enjoy a stay away from the fuss. One of the characteristics of Vila Monte is its ability to make us forget from what’s around us and, in the Solarium Suite, we feel this isolation even more. So, if what you’re looking for is a place marked by the tranquility of the South, full of light and where you can relax and get away, then this is the right suite for you. On the terrace, which stretches along the entire length of the dwelling, you will discover a game of shadows and light made possible by the wooden pergola and the geometric designs that form the wall and that give it a natural climate and a transparency effect for the common areas of Vila Monte. With a distinctly Algarvian architecture, this suite also has a private solarium located on the old ‘açoteia’ roof terrace, a place traditionally reserved for the drought of the fruit, which is now a rooftop overlooking the green of the garden and where you can enjoy a moment purely yours. The interior, like the exterior, is marked by the white that is being cut here and there by design notes that refer to local handicrafts - wood, basketwork, rope. A clean space where simplicity becomes a luxury. And as our priority is your well-being, this suite also offers Butler service, to answer all your needs, making your stay a time to relax. Located in Casa de Cima (exclusive building for adults) this suite consists of living room, bedroom, bathroom with shower, an outdoor terrace and solarium. There are places that produce in us a sense of well-being, and then there are places that, from the first moment, instill in us a ‘returning home’ sense. The Lounge Terrace Suite is like this: at the entrance a typical Algarvian brick floor that evolves throughout the room and helps the natural climate, while at the same time contrasts with the white that marks the various divisions of the suite and that is further expanded by the light that enters through the windows. 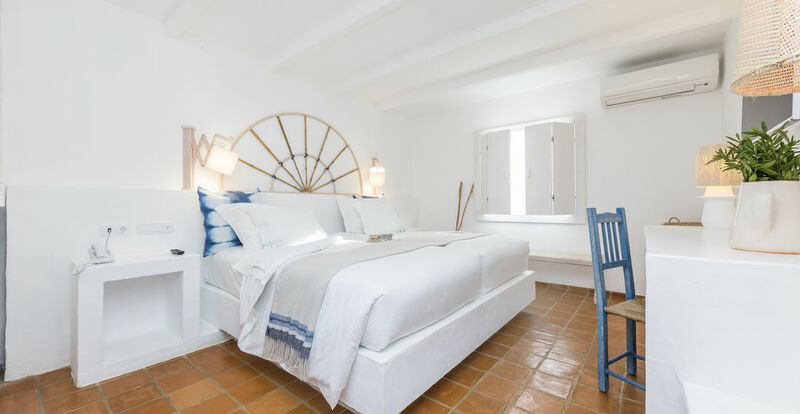 In a space where simplicity is the great luxury, you will find several elegant design notes with traditional reminiscences of the region's crafts, such as rope lanterns, wooden trusses, Algarve basketware and pottery, as well as a salamander that you can light on cooler evenings. And because the southern climate invites to it, this suite has at its disposal a patio with table and seating area, where the wooden pergola creates a game of shadows and clarity that reminds us, all the time, that this is a meridional territory. In addition, there is the private solarium located on the old ‘açoteia’ roof terrace, now transformed into a terrace with a bar with a 360 view, from where you can see much of the property of Vila Monte, the Algarvian barrocal, the mountains and the sea. And as our priority is your well-being, this suite also has a Butler's service, whose role is to ensure your well-being and also that the travel plans and your itinerary are executed perfectly. Located in Casa de Cima (exclusive building for adults) this suite is composed of a living room, bedroom, bathroom with shower, patio and a solarium. This is the right suite for anyone looking for a getaway where they can have unique moments. A suite that you will find, hidden in Casa de Cima (exclusive building for adults), as a place that has been lost in a different reality and where the passage of time takes place at its own pace. With a characteristic atmosphere romantic and from the South, marked by the Algarve architecture, here all the furniture is part of the building itself and it is the white that dominates the space, amplifying even more the light that enters through the windows. The design is pure but elegant, with handcrafted pieces inspired by the Algarvian traditions, such as basketwork, rope works or woods. The garden, with 195 m2, accommodates several different environments that live in perfect harmony. 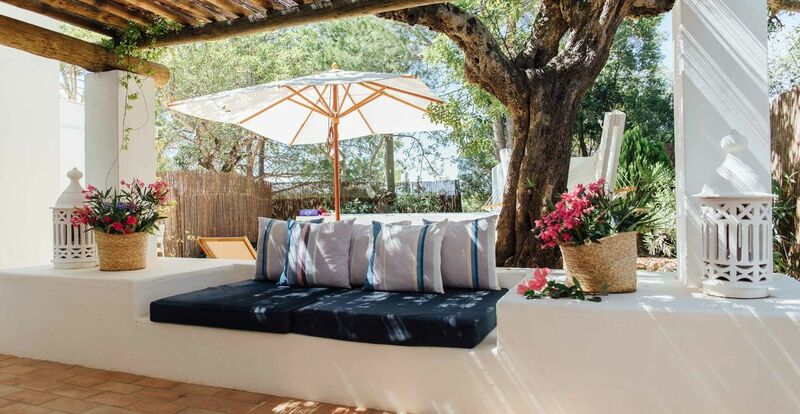 A patio with a table, chairs and sofa – carefully protected from the sun by the wooden pergola and the shadow of the huge carob tree –, where you can have a light meal. A solarium area with sun loungers to enjoy the Southern European climate. 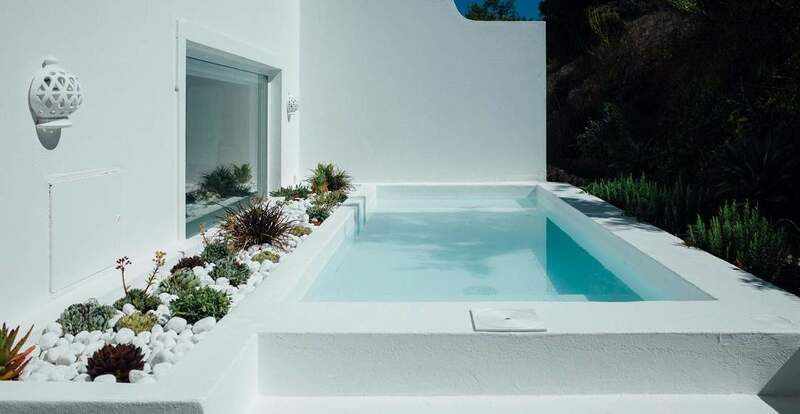 Finally, an plunge pool that reminds the typical Algarvian tanks. And as our priority is your well-being, this suite also has a Butler service, to answer all your needs, from packing your luggage to making a reservation for a restaurant, a massage or an experience. Even planning a surprise to your best half. Distributed by a space that is organized on several levels and connected by steps, the Secret Suite consists of a living room, a bedroom, a bathroom with shower and a private garden from which you will have difficulty getting out. For a vacation of sharing, both the time and the space with which is closest to you, this is the perfect suite. Two communicating suites, where you can stay with the closest ones, but without losing your privacy. 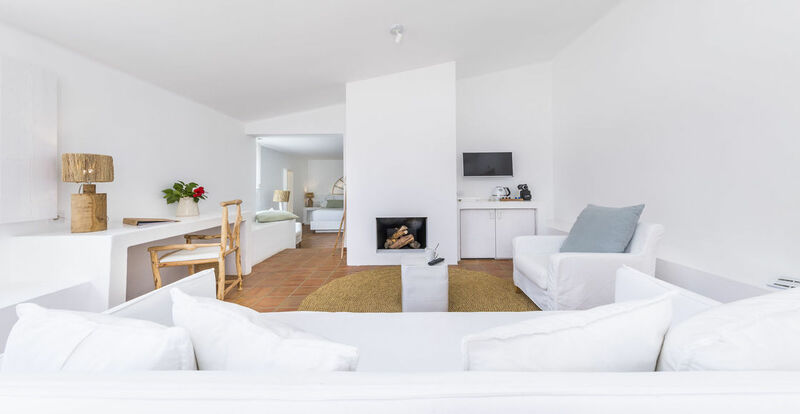 On arrival you will find a typical Algarvian brick floor that evolves throughout the room and contrasts with the white walls present in all divisions and amplifying the light, so characteristic of the Algarve. In a space where simplicity is the great luxury, you will find several elegant design notes with traditional reminiscences of the region's crafts, such as rope lanterns, wooden trusses, Algarve basketware and pottery, as well as a salamander that can light on cooler evenings. Take some time to sit in the living room, look around and feel the regional tradition and ambiance while sipping an espresso from the machine we set there just for you. This suite has at your disposal two courtyards with table and seating area. In addition, there is a private solarium located on the old roof terrace, now transformed into a solarium with sofas and a bar with a 360 view, from where you can see much of the property of Vila Monte, the Algarvian barrocal, the mountains and the sea. Located in Casa de Cima (exclusive building for adults), Vila Monte Master Suite consists of 2 rooms, 2 bedrooms, 2 bathrooms with shower, 2 terraces and private solarium. In traditional architecture it’s the habits that constitute the habitation, which means, its function that propitiates the architecture. This was the case in the Algarve, the southernmost part of Portugal - with high temperatures and Arab influence - where it was necessary to think about cooling solutions for the interiors. The Casa Pátio of Vila Monte corresponds to one of the most strikingly Algarvian architectural typologies, and also the one that most refers to Arabian ancestry of that territory. A two-storey building that develops all around a courtyard and with a fountain in the center. Upon entering we find a dialogue in perfect harmony between the white of the walls and the color of the plants climbing them, freshening the air of the patio. A relaxing environment for those looking for a stay in a place full of tradition. Although this suite is in Casa Pátio, its entrance is independent from the rest of the building, through the garden, which gives it a lot exclusivity and a privileged connection with nature. Facing east and with a courtyard just outside the entrance, here you can enjoy a coffee while enjoying the colors and sounds of the dawn. 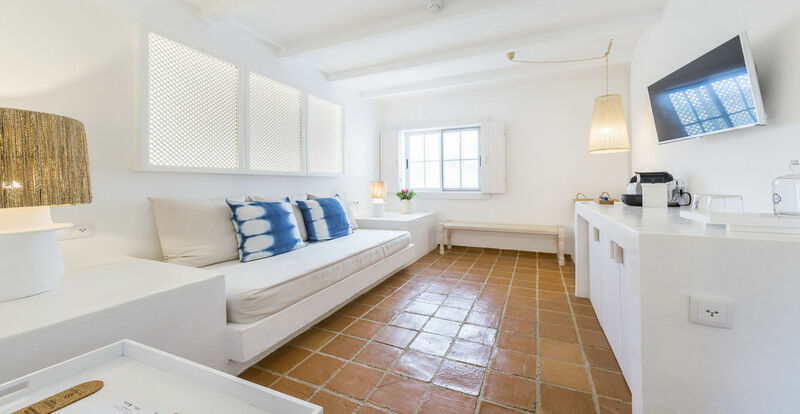 The interior is marked by the white walls and furnishings, the luminosity that comes from the outside and the terracotta of the Algarvian tile, which covers the whole floor of this suite. Here and there some pieces of design that celebrate the local artisan tradition, such as basketwork, woodwork or glazed pottery. And, in perfect contrast to the interior, the private garden of this suite. An exclusive space where you will have the best of the climate of this region: the shade of the trees and the location at one extremity of the Casa Pátio give this place a mixture of shade and light and a natural protection against the wind, while the geometric forms of the walls and the rustic wooden fence, allow to create transparencies between this private garden and the external garden. Take a deep breath and relax. This suite also has a Butler service, to answer all your needs and according to your preferences. The Sun Rising Garden Suite is composed of a living room, bedroom, bathroom with bathtub, a small patio at the entrance and a private garden where everything has been thought out in detail. The ideal place for those who want to make their stay at Vila Monte a retreat. This suite, which is the combination of two connecting rooms, is located in the Casa Pátio, although its entrance is independent of the rest of the building. You come to it through the garden, which gives it an exclusive character, for a holiday with your beloved ones. The interior is marked by the white walls and furnishings, the luminosity that comes from outside and the terracotta of the Algarvian tile, which covers the whole floor of this suite. Scattered throughout the space you will find several pieces of design: a celebration of the local artisan tradition, with basket pieces, woodwork or glazed pottery. And, in perfect contrast with the interior, the private garden of this suite. Give your family a unique experience with the best of the region: the shade of the trees and their location at one end of Casa Pátio give this place a mixture of shade and light and a natural protection against the wind, while the geometric forms of the walls and the rustic wooden fence make it possible to create transparencies between this private garden and the external one. And if at some point you need a couple’s moment, Vila Monte offers a babysitting service. The Family Garden Suite consists of two communicating rooms, both with living room, bedroom and bathroom with bathtub. In addition, there is a private garden where everything has been thought of in the smallest detail, and each room also has a small courtyard at the entrance. The ideal place for a family retreat. In a corner of the first floor of Casa Pátio is this suite, a space specially designed for families. The entrance is via an outside staircase, independent from the rest of the building - which makes this accommodation a more exclusive space - and gives access to the two bedrooms, one with double bed while the other has two single beds. A place that combines the features needed for a family holiday – with games, crayons and other surprises for children – with the architecture and design that are the postcard of the Suite Collection – bright and clean rooms with white walls and floors with Algarvian tiles that help the natural air conditioning, which refer to the region's traditional traditions, from wooden lanterns to the frameworks. 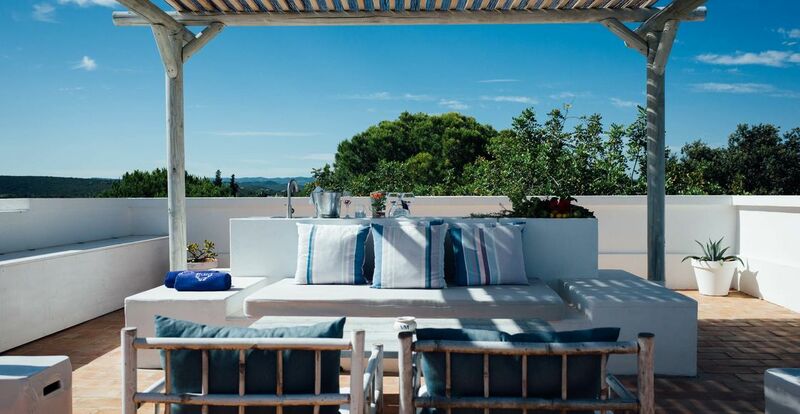 Here, from the moment you enter the Family Corner Suite, you breathe the Algarve. Take the opportunity to deepen ties and create memories that will last in time. And because your well-being is the most important thing for us, we offer you a babysitting service, for a special rate. This suite consists of a living room, 2 communicating rooms and 2 bathrooms with bathtub. There are buildings that are just that, just buildings. And there are buildings that, by their characteristics, gain completely different forms, functionalities and uses. The Laranjal Building is one of these. It could be a Moroccan Riad - a rectangular space that develops on two floors and along a corridor that is, in fact, a Algarvian orange grove, and which ends at one of the restaurants of Vila Monte Farm House. Here is not the nature that surrounds the building, but the opposite. There is a constant presence of the green of the orange trees, their smell and the freshness that the existence of this orchard allows, in a perfect synergy between the trees and the candid architecture that rises there. The Laranjal Building is a place of introspection, of sensory experiences that put our senses to the test. The Laranjal Master Suite is the best kept secret of Vila Monte Farm House. Located on the ground floor of the Laranjal Building, at one end, no one could imagine that behind the door to that room hides one of the most exclusive suites in the entire complex. 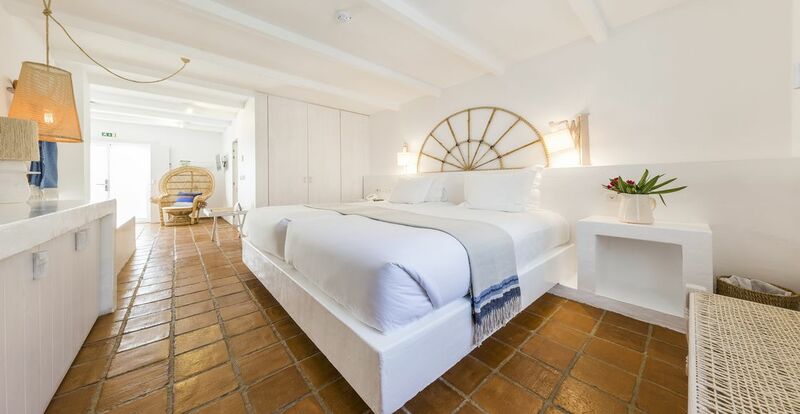 In a perfect Algarve all suites would be like this - an open space marked by the white walls and design notes that constantly lead us on a journey through regional traditions and customs, such as furniture that is an integral part of the architecture of space, or tapestries, the wooden frameworks and the wall lamps with geometric works that resemble the typical chimneys of the Algarve. The bathroom has its own personality, spacious and immersive. A bathtub of an impressive size in turquoise blue, like the sea, and which contrasts with all the surrounding light - from the white walls to the unique luminosity. Right in front of you opens a huge window that allows us to discover, on the other side, an plunge pool inspired by the tanks of the Algarvian houses of the old days. The pool is located in the private garden of the suite, covered with endogenous vegetation and where you will also find a patio where you can dine - with table and chairs - and a solarium area, to enjoy the best that the South has to offer. And to make your stay even more enjoyable, there is a Butler service at your disposal to satisfy and arrange all your requests (personalized bar and private dinner not included). This suite consists of living room, bedroom, bathroom with shower and bathtub and a private garden with terrace, solarium and a plunge pool.